“Owning my own private island” is such a wild fantasy that it is usually reserved for Hollywood rags-to-riches movies that end with Eddie Murphy and Dan Aykroyd sipping champagne on a beach. But the world is crazy, and you can now buy a tiny island off the coast of Scotland for the same price as a minuscule two-bedroom home in Queens. Linga is a 63.75-acre isle in the Vaila Sound in the Shetland Islands, which are 70 miles north of the northernmost tip of Scotland. 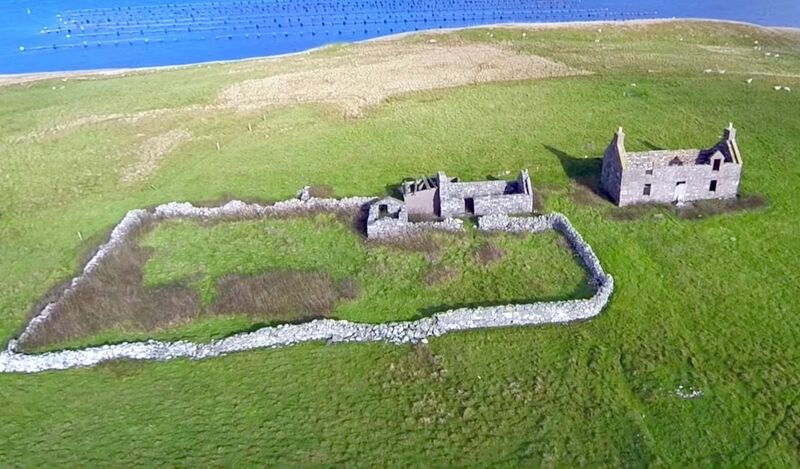 The grassy little island is home to two cottage ruins, a loch, and views of mainland Shetland’s rocky coastline. The last inhabitants of Linga left in 1934, but a quick boat ride will get you to the coastal village of Walls (pop. 978) for when you need to get some socializing in. And all of this can be yours for about $350,000 USD. There are a few things to bear in mind, however. For one, this is the Shetlands, not the Bahamas, so expect a lot of rain and wind (although the thermostat is typically resting in a comfortable 39-50 degrees Fahrenheit). Also, there is no power or plumbing, and despite their sturdy foundations, the absence of a roof really devalues the livability of the island’s cottages. But hey, summer projects are good for us. Another challenge is that Scotland’s strict zoning and development laws will prevent you from building too much on the islands, but you will be permitted to construct a third cottage, agricultural buildings, solar panels, a windmill, and a new pier (crucial for island living). Considering that the average home prices in New York City and Los Angeles regularly top half a million dollars, maybe rebuilding your life on a deserted, barren island in the North Atlantic Ocean isn’t the craziest investment.